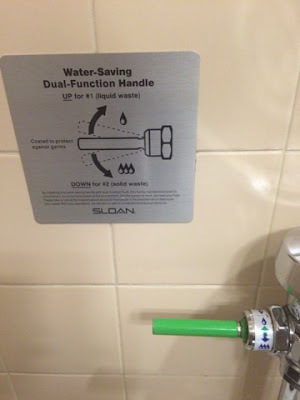 I've been seeing these water saving toilets recently, and their design is not great. This handle should be paddle shaped so that it can only move up or down in one dimension, not so that you can still move it in two dimensions up and down or back and forth. Plus, the stickers on the actual toilet don't seem to make sense, does it mean strait up or up towards the back? A paddle design that only goes up or down would be much better. That being said I'm not sure what sort of internal plumbing changes might be required. There is probably a reason they stuck with the old style handles. That being said, it's a great intention to try and save water, we Americans waste so much! I'm pointing this out because is it design, is it engineering? Certainly it's a cross functional team, and I think they can do better. Sometimes you don't know the best way to do something until it gets out in the field, and this is a nice simple example that can help convey the kind of decisions that engineers and design people make about form and function every day. Don't get me started on faucets... they's generally horrible.